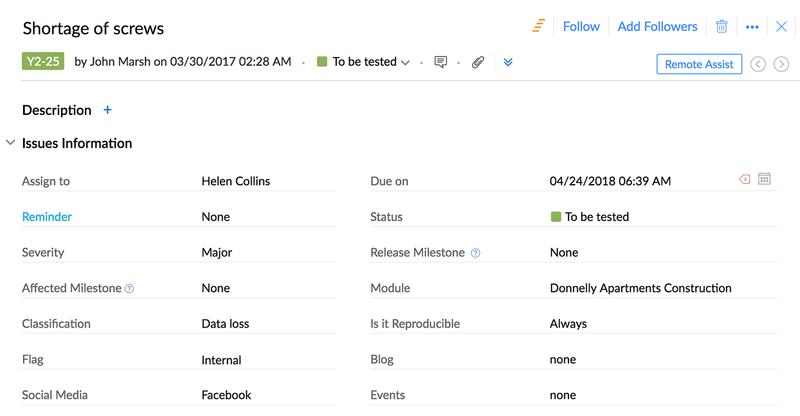 View progress of your issues in List View or Kanban View . This is the place to track your status, severity, assignee, and other details relevant to the issue. Select a project and navigate to Issues. Select a Project when submitting from My Issues view. Enter other details if necessary. If your project has mandatory custom fields then you must enter data for these fields before you can save the issue. Click Save & Add New to continue adding issues. 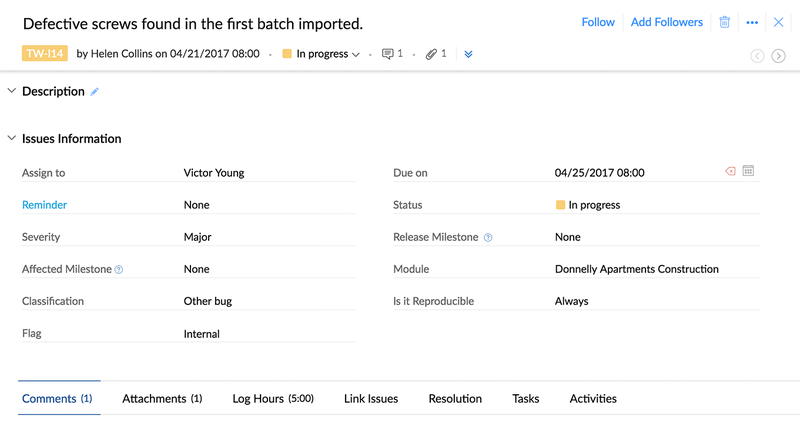 Click to the right of the status to add issues in the Kanban View. Tasks and Issues will have a unique ID with a prefix preceding the ID. For example, if the Task & Issue Prefix is set as TW, then the task and issue ID will be TW-T001 and TW-I1, where T is for Task and I is for Issue. Task & Issue Prefix can be set when creating a new project. Task & Issue Prefix can be changed while editing a project. 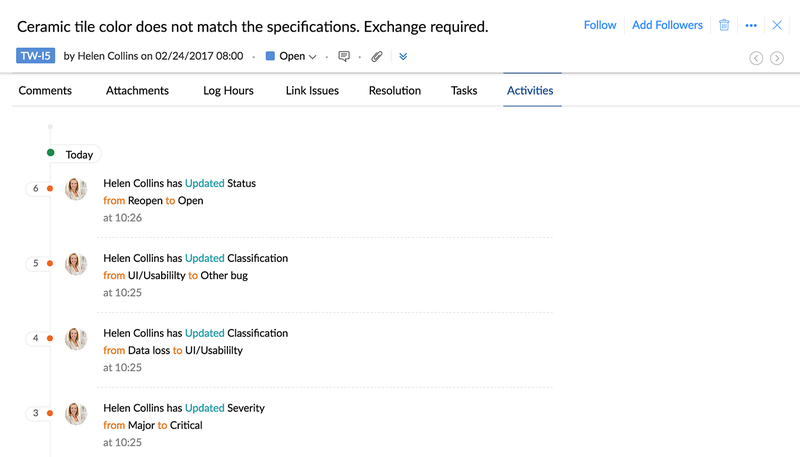 Use issues ID to search for issues. # mention an issue using issue ID in feeds, status, and comments. Add a description or update the details using Edit Description. Edit the required fields under Issues Information. Hover over the field to view the edit option. The changes are saved automatically. Scroll the issue details page to add additional information to the issue. Comments: You can add comments while modifying an issue. Use the screen-grabber to share screenshots or the in-built draw tool to highlight or obscure areas. Attachments: Attach and share screenshots using the screen-grabber. Attachments added in Comments and Resolution section are shown here. Resolution: Use this option to resolve the issue. You can also add attachments and screenshots when resolving an issue. Log Hours: Add the time you spent on resolving the issue. You can also set the start and end time. Link Issues: You can link and classify related issues. Activities: View the history of the issue. The activities are listed chronologically. Follow or Add Followers to the issue. Click Follow to track the issue or Unfollow to stop. Click Add Followers to select and add project users to the issue. More Actions: Click in the upper-right corner to show more options. You can move, clone, or print an issue. Use Notification Helper to check if you will be notified for any given notification event. Click the chat icon to start a discussion or to post a issue update. The issue owners and creators are the default participants. Add new participants before you start the discussion. Click the chat icon to catchup on the previous discussions in the history. Besides, you can also delete or edit a conversation. To edit or delete a particular conversation hover over it, click and select Edit or Delete option. Stay on track and don't miss out on any project updates. New participants cannot be added later. This feature is available for Express, Premium, and Enterprise users. You need not worry about missing deadlines anymore. 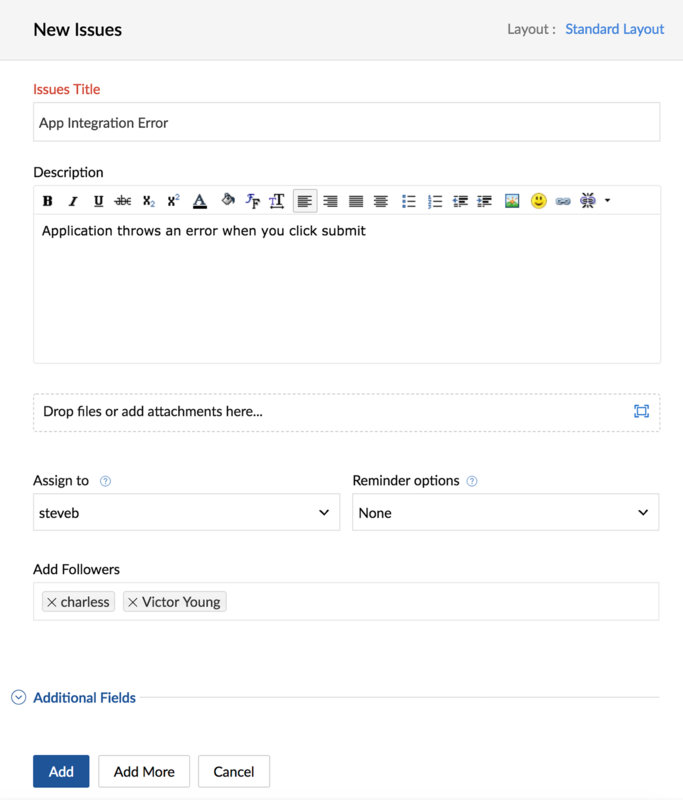 Premium and Enterprise users can set reminders for issues and the assignee will receive a reminder email. When submitting an issue, click Reminder options to set a reminder. When editing an issue, click Set Reminder to set or delete a reminder. None: No reminder is set. You can also use this option to delete reminders. Daily: The user assigned to the issue is notified every day until the due date. On the same day: The user assigned to the issue is notified on the due date. Days: You can choose any number of days between 1 and 30. If you select 3 days, the user is notified 3 business days before the due date. In the Kanban view, click the Submit Issue icon and add an assignee to view the options for setting a reminder. In the Kanban or List view, click on an issue. The Remote Assist option is available under More Options (only if the issue is assigned to you). When you click this option, it invites the reporter to share their screen with the assignee so that they can assist in resolving the issue. In the Kanban or List view, click on an issue and then click in the upper-right corner to delete it. View issues using predefined lists or create custom views. By default, all open issues are displayed on the screen. You can export or import issues to and from xls or csv files.